Our clean room ceiling tiles (also referred to as panels) are used to create a flush clean room ceiling system, allowing facility owners to use the area above the clean room for mechanical services or walk-on capabilities for maintenance access, when applicable. 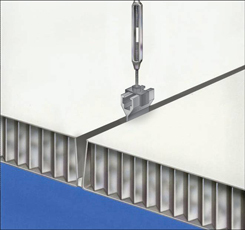 The PharmaCeiling™ clean room ceiling tile is a 2" thick composite panel that features a steel skin on both sides of an aluminum honeycomb core. Available with a variety of coatings and finishes, the steel facings are designed to form tight, straight-line joints between adjoining panels and beams. All clean room ceiling tiles are Class A, non-combustible. The use of walkable ceilings for access can minimize the need for catwalks above the clean room areas, reducing steel costs and installation time. The use of catwalks can then be limited to areas where equipment access is needed for maintenance or replacement of larger pieces of equipment (AHU motors, cooling coils, heat exchangers, etc.). Alternate surfaces and cores are available to meet the requirements of any type of clean room application. Surfaces offered include melamine, vinyl, painted steel, stainless steel, Fiberglas™ reinforced plastic (FRP), polyvinyl chloride (PVC), high pressure laminates, and porcelainized steel. Panel cores are available in expanded polystyrene, paper honeycomb, aluminum honeycomb, gypsum, isocyanurate, and mineral wool. Our commitment to maintaining the highest quality standards extends to our national network of specialized clean room contractors. All of our contractors maintain the highest quality control programs to assure compliance with all critical standards. As independent contractors, they choose to work with PortaFab because our systems are the most cost effective products for constructing quality cleanrooms.